Prof G do you think disability improvement is a reasonable treatment goal? Two weeks ago one of my patients with PPMS, who we treated with off-label subcutaneous cladribine, came for her annual follow-up appointment. Despite being treated with cladribine over 2 years ago she has unfortunately progressed from EDSS 5.5 to 6.5. Her latest MRI brain did not show any new T2 lesions. She asked why we hadn’t scanned her spinal cord. She is desperate for us to find some disease activity so that she can be retreated or preferably offered ocrelizumab. She has a well-off family member who is prepared to cover the costs of ocrelizumab treatment privately. What should I do? As you know I don’t support private prescribing in the NHS as it undermines the NHS’ founding principles; free at the point of access and equity. However, it is difficult to say no to private prescribing if a patient insists, particularly as there is now a mechanism to do this under the NHS. I am also first a doctor looking after the individual patient and this takes priority over my duty as an NHS employee and guardian of its socialist healthcare ideals. I didn’t agree to a private prescription for ocrelizumab. Instead, I batted the problem into the long grass and agreed to bring her via our planned investigation unit for an MRI of the spine and lumbar puncture to measure CSF neurofilament levels. If there are new spinal cord lesions and/or a raised CSF neurofilament level then we could potentially look at an additional course of cladribine, off-label rituximab under the NHS, private ocrelizumab or possible recruitment into a clinical trial. I suspect that the MRI will show no new lesions and the CSF NFL levels will be normal. If this is the case then she has NEDA with worsening disability. I did refer her to my blog post on this issue (EXPLAINING WHY YOU GET WORSE DESPITE BEING NEDA) so she could get some understanding of what was happening to her. During the consultation, she asked me ‘why a friend’s daughter with very bad MS, who had been treated with alemtuzumab, had made such a remarkable recovery?’ Apparently, this young woman had been rendered partially paraplegic from a spinal relapse and after alemtuzumab had recovered function and was now walking almost ‘normally’ again. My patient wanted to know why there was such a difference between herself, someone with PPMS, and her friend’s daughter a young woman with highly-active RRMS. You may remember the other day I asked you to guess why I was so impressed with the HSCT-MIST trial. Let me try and explain why. Should we be changing our expectations of what DMTs can offer pwMS? Are we entering an era when the expectation of disability improvement becomes the norm? I certainly hope so. The most impressive aspect of the recent HSCT-MIST trial was not the NEDA data or the improved safety of HSCT, which are obviously important, but the disability improvement data. During the first year post-HSCT the mean EDSS scores improved from 3.4 to 2.4 vs. a worsening from 3.3 to 4.0 in those on the basket of licensed DMTs. Is this unique to HSCT? How does this HSCT data compare to other treatment options? The first DMT to show a convincing impact on disability improvement in a phase 3 controlled trial was with natalizumab in the AFFIRM study; at 2 years the probability of a sustained improvement in disability was 30% for natalizumab-treated patients and 19% for patients who received placebo. Phillips et al. Sustained improvement in Expanded Disability Status Scale as a new efficacy measure of neurological change in multiple sclerosis: treatment effects with natalizumab in patients with relapsing multiple sclerosis. Mult Scler. 2011 Aug;17(8):970-9. 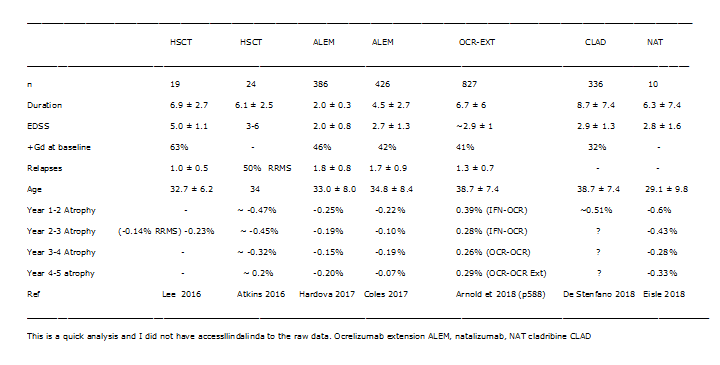 The next convincing phase 3 result was with alemtuzumab-treated patients in the CARE-MS2 trial; alemtuzumab-treated patients were more than twice as likely as IFN-β-1a-treated patients to experience 3-month confirmed disability improvement (35% vs 19%). Giovannoni et al. Alemtuzumab improves preexisting disability in active relapsing-remitting MS patients. Neurology. 2016 Nov 8;87(19):1985-1992. Unfortunately, the latest HSCT trial did not report their disability improvement data as confirmed or sustained disability improvement at 3 months. The main reason for this was methodological in that patients patients on DMTs had a rescue option of being treated with HSCT. However, in the first 12 months, 12/55 (22%) of patients on DMTs compared to 38/55 (69%) who were treated with HSCT had an improvement in their EDSS. Based on the final data set I suspect that in a large proportion of the HSCT patients the improvements were sustained. Burt et al. Effect of Nonmyeloablative Hematopoietic Stem Cell Transplantation vs Continued Disease-Modifying Therapy on Disease Progression in Patients With Relapsing-Remitting Multiple Sclerosis: A Randomized Clinical Trial. JAMA. 2019 Jan 15;321(2):165-174. What about the new kids on the block, i.e. ocrelizumab and cladribine? Unfortunately, we don’t have published data on cladribine, but I will try and rectify this and will ask for the analysis to be done. However, the phase 3 pooled OPERA data of ocrelizumab has been published; 21% of ocrelizumab-treated patients had disability improvement confirmed after at least 12 weeks compared to only 16% of IFN-β-1a-treated patients. Hauser et al. Ocrelizumab versus Interferon Beta-1a in Relapsing Multiple Sclerosis. N Engl J Med. 2017 Jan 19;376(3):221-234. So the league table for disability improvement of HSCT over alemtuzumab, over natalizumab, followed by ocrelizumab seems to mirror the brain atrophy or end-organ damage data. Are you surprised? I am not. A large driver of disability improvement is reserve capacity, i.e. brain reserve or put simply the size of your brain, which predicts and provides the substrate for recovery. This is another reason why you would want your MS treated early and just maybe you would want to flip the pyramid and go for the DMTs that offer you the best chance of disability improvement. Hidden in this data may be a clue about the pathogenesis of MS. What differentiates HSCT and alemtuzumab from natalizumab and then from ocrelizumab? Could it be the transient depletion and reconstitution of the T-cell compartment? Joanne Jones and her colleagues from Cambridge showed that among trial participants with no clinical disease activity immediately before treatment, or any clinical or radiological disease activity on-trial, disability improved after alemtuzumab but not following interferon β-1a. They suggested that this disability improvement after alemtuzumab could not be attributable to its anti-inflammatory effects and suggested that T lymphocytes, reconstituting after alemtuzumab, permit or promote brain repair via the production of growth factors in particular brain-derived neurotrophic factor (BDNF), platelet-derived growth factor (PDGF) and ciliary neurotrophic factor (CNTF). If their hypothesis holds out then this may be another reason why NIRTs (non-selective immune reconstitution therapies) outperform SIRTs (selective immune reconstitution therapies) in going beyond NEDA, i.e NEDADI. And just maybe you need these cells to traffic to the central nervous system to deliver these growth factors. Jones et al. Improvement in disability after alemtuzumab treatment of multiple sclerosis is associated with neuroprotective autoimmunity. Brain. 2010 Aug;133(Pt 8):2232-47. Another piece of the puzzle is the positive effect alemtuzumab has on the MRI metric called magnetization transfer ratio or MTR, which is a measure of tissue integrity. In a small study, the mean MTR fell in 18 untreated MSers in normal-appearing grey and white matter. Conversely, mean MTR was stable in 20 alemtuzumab-treated MSers, which suggests alemtuzumab protects against tissue damage. This MTR data mirrors the clinical observations and is congruent with some of the basic science. Wouldn’t it be nice to do an experiment of using natalizumab post-alemtuzumab to see if by blocking T-cell trafficking we blunt the alemtuzumab-associated improvement in disability, i.e. to test whether T-cell trafficking is required to drive repair mechanisms? Button et al. Magnetization transfer imaging in multiple sclerosis treated with alemtuzumab. Mult Scler. 2013 Feb;19(2):241-4. So what do I tell my patient? Do I tell her that the reason why she has not improved is that she is older, has more advanced MS and hence less reserve capacity to allow disability improvement? Or that we may not have tackled the root cause of her MS with subcutaneous cladribine? I stuck to the former explanation as the latter is simply a hypothesis that needs more thinking, more debate and some new experiments to establish if the treatment hierarchy in relation to end-organ damage and disability improvement is based on the different modes of action of our DMTs. Despite the reasons behind these observations we are now entering an era were disability improvement is not an unreasonable expectation for pwMS, provided they are treated early and with high-efficacy DMTs. How many you have been told about disability improvement on DMTs? CoI: multiple, please note that I am a co-author on the natalizumab, alemtuzumab and ocrelizumab disability improvement papers. We have not formalised any criteria for using off-label rituximab yet. However, this would include patients with active PPMS who at present can’t be treated in the UK on ocrelizumab. The NHS has a mechanism via the private patient service to be treated with treatments that are not covered by the NHS. The costs don’t only include the drugs, but the costs of administering it and the use of NHS staff time. Please note the legislation to do this was promulgated under Andrew Lansley a conservative minister of health. It was mainly addressing high-cost cancer drugs that were not being approved by NICE. However, the knock-on effects have been in other disease areas. Apparently, this legislation had cross-party support, which I found hard to believe. Andy Burnham who was the then shadow, labour, health minister tried to oppose it was silenced by the New Labour cabinet. Are there any worries prescribing someone ocrelizumab after having been treated with alemtuzumab? Or is there a preferable gap to be left between treatments? Under the current NHS England treatment algorithm, we cannot use ocrelizumab after alemtuzumab. This is due to costs reasons. However, outside the NHS I see no reason whey ocrelizumab cannot be used post-immune reconstitution. I have never been told DMTs improve MS. Although it took few years to accept it. I must be dreaming but my experience on Cladribine is that it is slowing progression down a lot…. I wouldn’t say stops ms . Are there good responders on Cladribine? for how long? It would be interesting to know. Yes, cladribine is pretty good DMT in highly active MS at reducing relapses and new MRI activity. Its impact on disease progression was remarkable. Cladribine is also one of the easiest DMTs to use in clinical practice and has a very good adverse event profile with a very low monitoring burden. All these attributes will make it a winner in the IRT space. Prof G what about your patient’s hand function? Surely the cladribine is helping maintain her upper limb function? Yes, that is one of the main reasons for treating her with off-label cladribine to try and protect upper limb function or at least slow down the loss of arm function. This is why DrK has spent the last 3 years getting the #Chariot-MS trial funded. Sorry if you have explained this in one of your many posts about cladribine before but why would cladribine help upper limb but not be that effective in Lower limb? Or would other drugs which are more effective in Lower limb for example alemtuzumab be more effective than cladribine in maintaining upper limb function they just haven’t been selected to be used in such trials as Chariot owing to availability? There is more reserve capacity in the pathways supplying the upper limbs and hence more to protect and more likely to get disease improvement. This observation and prediction underpins our length-dependent axonopathy hypothesis and is the basis for the ORATORIO-HAND and CHARIOT-MS studies. Thanks I know the criteria which will be used probably for the chariot trial what is the criteria for the Oratorio trial? Based on the general effectiveness of Ocrelizumab and cladribine I assume people are expecting better results from the Oratorio trial and the chariot trial should it go ahead? We think cladribine may work better than an antibody in advanced MS as it is CNS penetrant and more likely to target the B-cell follicles. Interesting post, thank you. Any chance of someone with SPMS having disease improvement on alemtuzumab or HSCT? Yes, we saw this in the ASCEND or Natalizumab in SPMS trial. In fact, if the ASCEND trial outcome was disease improvement the trial would have been positive and just maybe natalizumab would have been licensed for SPMS. It is important to note that the disease improvements occurred early rather than late. A similar observation was noted in the high-dose biotin trials. This suggests the biology of disease improvements is different to disease worsening. About the pathogenesis of MS. EBV still exists after IRTs. Do you think that this immune reconstitution might be breaking a vicious relationship related with EBV? Or it might be closer to the T-cell exhaustion theory? I tend to the first. Alem. does not penetrate brain but can have similar effects to HSCT which does, so even if there is innate activation driving neurodegeneration it is still seems outside-in and not the opposite. What is that puts the plug out from this activation? Is T cell reconstitution enough? Interesting to read about T lymphocytes promoting brain repair after Alem. Again a very up to date post ProfG. Not necessarily; there are case reports of people becoming EBV negative post-HSCT and there is one case (unpublished) post-alemtuzumab who became EBV negative. So IRTs may all work by reducing the EBV viral burden. However, some patients have reactivation of EBV (mono) after HSCT -and not that few- but still do great. It must be more coplex than a simple EBV titer. This is speculative fantasy, hitching on to the trendy bandwagon of the time of “protective autoimmunity”. You don’t hear much about it now for good reason. I think I agree with MD2’s interpretation of this. The disease improvement rate on natalizumab seriously dents this hypothesis. Natalizumab blocks T-cell trafficking into the CNS and disease improvement is pretty impressive in natalizumabers, particularly when they are treated early. Fine and dandy in the periphery but you don’t regrow nerves in the CNS. but I think not…not a one in 2,000 years of history..? Yes, I have one patient who improved from EDSS 6.5 to 6.0 and finally to 5.5. This coincided with him losing 30+kg of body weight. He was obese when he started and has ended up with a normal BMI. Thanks to your posts, vids etc ProfG I was aware of the possibility of disease improvement when seeking to have Alemtuzumab. Since which I’ve been feeling increasingly decrepit and ancient in regards to disease progression and the efficacy of DMTs, due to the content of so many of the posts. Here again you came to the rescue in clarifying you have seen improvements, albeit more slowly, in your older patients. Well, I completed my two rounds of Alemtuzumab 14months ago and I was 55 in December and today for the 1st time in 3 years I managed to walk 5km on the treadmill. Perhaps it’s an appalling case of wishful thinking, but is it true of all of us, those with or without treatment that we can do some negation, some off-setting by the obvious means of diet and exercise etc??? Have to ask in view of your reply above and having made this achievement today – as an Old! Are minor viral infections, i.e. common cold virus, taken into account during DMT trial analysis? I ask because I am absolutely convinced that infections with the common cold virus play havoc with my PMS. I avoid them like the plague. But I know – I am but an anecdote. In the same vein, I am sceptical about whether EBV only plays a role in MS. Yes, about a third of relapses are preceded by an infection, typically a viral infection. The link between infections and relapses was confirmed in the early interferon trials. Do you think that a cold virus infection allows EBV to flare up and trigger relapse? The thing that triggers MS in genetically susceptible individuals in the very first instance? Without EBV, the door to MS remains shut… Yes, maybe! Please keep on with this research! Are you expecting any novel treatments to be licensed over the next couple of years? In the absence of the above, shouldn’t she start exploring HSCT at this stage regardless of how well she is responding to natalizumab, to stop her brain from shrinking? We have no evidence to make a call on this. This is one of the many kinds of treatment trials we need to explore these questions. I am not sure if there will be enough investigators or pwMS to buy into a strategy such as this, which you could argue is very high risk. Natalizumab is pretty good at slowing down brain volume loss in MS. Some data suggests there is ongoing grey matter loss, which may be due to mechanisms that are beyond what natalizumab can tackle, for example, intrathecal plasma cell activity, microglial activation, etc. This is why we need to do add-on studies to explore these hypotheses. Thank you. A follow-up question to you reply. What add-on treatments would possibly work with natalizumab to slow down or stop end organ damage? Is Biogen looking at any? and has anyone in Sweden or elsewhere tried the tysabri + rituximab (or tysabri + cladribine) combi? And furthermroe: isn’t HSCR the only treatment that has a shot of halting the progression from RRMS to SPMS? Not all of them and it depends on how you define SPMS. Most who become progressive have advanced disease when they go onto natalizumab, the other do very well. This is a circular argument it all depends on treating early and effectively and id you do all DMTs will delay SPMS. The definition of SPMS is a difficult one. Preventing it is another story. I don’t think any of the trials are long enough to answer this question. However Lemtrada and HSCT seem to exactly overcome these issues without add-ons, This is where the difference lies between IRTs and non-IRTs. (They have yet to discover a drug to address the above, and many neurological conditions will have an answer. It might not even be intended for MS in the first place). HSCT and alemtuzumab only overcome these problems if they are used early. Let too much damage accumulate and they don’t work as well. This is in the literature and is why the London HSCT group have an EDSS cut-off. I thought that reduction in brain volume was not seen in the ASCEND trial. I was referring to early RRMS and not SPMS when too much damage has accumulated and ageing mechanisms have been accelerated and brought forward. Great post and discussion – many thanks for this. Can we have some more information on the St Barts off label cladribine programme in terms of how long it lasts, and if it ends when NEDA is reached or at a specific time. Are there check ups to see if disease activity comes back again? Like all IRTs after the course of treatment ends (year 2) you rebaseline with an MRI of the brain and you repeat annually. The idea is that if there is any evidence of disease activity (EDA) you could offer another course or another treatment option. This particular patient is very well informed and feels her MS is active, which is why we are doing an MRI of the spine and LP. When we started her on cladribine ocrelizumab was not an option as it was not licensed yet. So would ocrelizumab have been a better option had it been available? Second question what is the update on Ocrelizumab being approved for progressive? This post is why I read your awesome blog. Loads of clear arguments to bring forward for the most effective treatments when seeing laggard neurologists. very interesting discussion. The possibility of improvement in EDSS was part of the discussion in my move to alemtuzumab after I failed rituximab (and 5 other less effective DMTs prior). Alemtuzumab is not for the faint of heart, so any potential positives were welcome in the discussion. EDSS improvements were not brought up in discussions with my previous neurologist who prescribed the rituximab, nor with the other medications I have also taken. The potential plusses were spoken of in context, of course, not as an expected goal. Most of a year past round 1 I’m lucky enough to have seen some modest, documented improvement. It’s still hard not to wait for the other shoe to drop, though. I am interested to hear why you failed rituximab and how alemtuzumab has changed that. Did you have relapses or new lesions on MRI? Or were you simply deteriorating with progressive MS? I was on rituximab for about 4 years and was relapsing about once a year where the average on rituximab is about once in 5 years. I do not have progressive MS. As a patient I really liked rituximab otherwise, it’s very easy to tolerate. A few months after my first round of alemtuzumab I had regained some arm tone and strength, some minor leg strength, and have lost a beat of clonus in my ankle. Those gains have remained stable. I have always walked unassisted, so it’s not a dramatic change, but it was a pleasant surprise. Did you get tested for anti-Rituximab neutralising antibodies? About 8% of people treated with rituximab develop NABs that could have stopped the drug from working. That is a really interesting data point, thank you! I was not tested for them, but it’s a much more appealing idea than the just being unlucky once again. Did you develop secondary autoimmunes after Alem.? I am asking because you were on RTX before Alem. So far I have not. I am less than a year after my first round of it, though, and incidence peaks at two(?) years, I believe, so I am not out of the woods. I was still missing my CD20s when I was infused with alemtuzumab, FWIW, but only time will tell. I must admit – it feels great to have Prof G back! Thanks again for your time and patience. Nobody has spotted my deliberate mistake in this post. Tony, I would have expected you to identify it? If you can I will send you an MRI lego kit for your kids to play with and that goes to anyone else reading this blog post. My mistake was equating MS the disease with MS disability. I have now corrected it. No reward for anyone. There are many anecdotal reports from patients who have a very rapid improvement (within a year or less) in their heat intolerance (they can take again hot showers). I thought that heat intolerance was related to axon damage and it would be something hard to improve, especially fast. Has this been reported in Tysabri too? Yes, this occurs on natalizumab. We think it is due to remyelination. Switch off the shredder and you allow spontaneous recovery to occur. What I do not understand is how you can compare the highly effective drugs against each other and against HSCT with regard to cortical atrophy and disability or improvement when there are no head to head studies. For example it is obvious that in the latest HSCT publication many patients had relapse at inclusion, and thus would get better anyway, and the control arm included many low effective medications. Sure. The data is what it is and that is why we are planning a head-2-head study between alemtuzumab and HSCT. Pharma is not going to fund this, which is why we need to rely on the NHS and similar organisations to fund these sorts of studies. Having had two courses of alemtuzumab and having two positively identified relapses and a worsening of hand function should a patient be eligible for a third round without MRI identified inflammation? Glad to hear you are doing much better after your third round of Lemtrada. Do you mind me asking if you had distinctive relapses with remissions prior to your rounds of treatment and whether or not your Lemtrada treatments have been given early on in your disease course? Best wishes. Oops! Just realised the 11.29am post yesterday was a case report so can’t expect a response to my questions..
Microbiome Research Where will it lead us?